interview in het Amerikaanse accordeonblad "Accordion Life"
possibly the most beautiful sheet music book ever published. In early February, Jean-Pierre Guiran and Cherie De Boer prepared to give a concert in Leeuwarden, a city of some 100,000 in the north of the Netherlands. 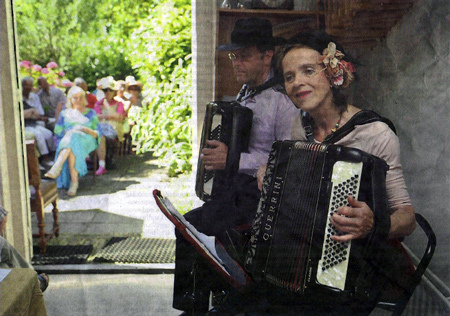 The concert venue was near their home along the coast of the Wadden Sea, so they traveled by car with their accordions, Jean-Pierre’s Hohner Lucia III and Cherie’s Guerrini Classic with cassotto, the same instruments they have used for some 30 years. Most of the 50 or so concerts for the coming year are within driving distance, since they will take place in Dutch cities or in nearby German cities such as Bremen, Hamburg, and Düsseldorf. The real rehearsal had already taken place during more relaxed moments, but the concert preparation the day before the performance had given them a mixture of renewed energy accompanied by a “feeling of paralysis” according to Jean-Pierre. Their program, as usual, had not been set beforehand; just a half hour before coming on stage, this was determined by the atmosphere of the place, the people, the weather and their mood. A small box contained sheets of paper with little poems, anecdotes, and whatever they might tell the audience, and there were Post-it® notes with song titles. The program was made at the last moment by choosing a combination of sheets and stickers. Even then new choices were made during the performance, all contributing to a freewheeling approach that kept things fresh. Their audience was treated to a musical world tour: French café music, tangos and sambas from South America, merengues and calypso from the Carribean, just to mention a few. The Beginnings Like many future accordionists, as a young girl Cherie heard the instrument on the radio and was attracted by its sound. She told her parents that she would love to play accordion, and luckily they found her both a teacher and a borrowed instrument. Within a year the one on loan was replaced by a little, blue, Italian accordion paid for on installments. 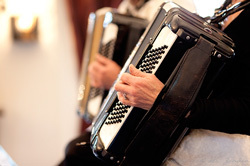 She stopped playing for a time during her teenage years, with the accordion under her bed, but later an accordion-playing friend encouraged her to take up the instrument again. Unlike Cherie, Jean-Pierre never saw an accordion until in his twenties. However, he had often heard accordion music on the radio in the Netherlands during its popularity in the 50s and 60s. The music played was mostly popular Dutch songs which he didn’t like so much, so he explored alternate musical sounds by teaching himself a little guitar and organ. Later, after seeing an accordion for the first time when in college, he borrowed one for a year and started playing and enjoying the instrument. He even started composing some of his first melodies at this time, including Helena and Solitude Heureuse, both of which have become familiar tunes to devotees of Accordéon Mélancolique. His organ background meant he was already acquainted with a piano keyboard, and the accordion’s left-hand buttons of bass and chords were reminiscent of playing the guitar. He was delighted to discover that the accordion felt like a complete orchestra in his hands! In the late 90s, the duo issued their first CD L’imparfait du Coeur. 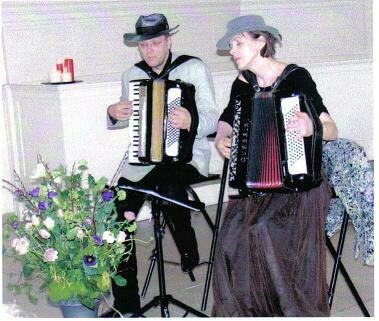 The recording was highly successful—indeed, it was chosen as the best accordion CD of 1999 in Sweden by the accordion magazine Dragspels Nytt. This acclamation was the stimulus to begin performing public concerts, where audiences were eager to buy the CD. They found that giving public performances was musically fulfilling and financially helpful to support their family that now included two sons. 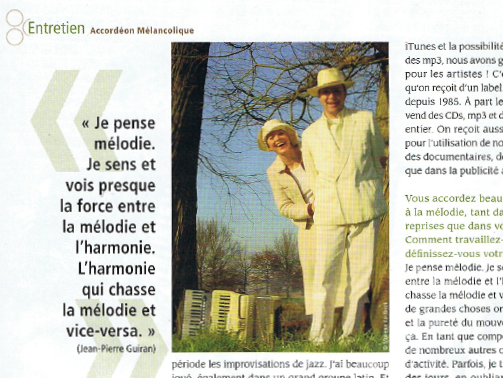 For over 20 years, Accordéon Mélancolique has pursued a busy schedule of performance, recording and music publishing. Their music has been adapted for a number documentaries and films. For example, some of their pieces are heard in the acclaimed documentary Picasso and Braque Go to the Movies, co-produced by Martin Scorsese. In 2008, the Julliard School of the Arts staged the dance Because There Isn’t Any, a work by Johannes Wieland, with songs mostly by Jean-Pierre. Their Music Accordéon Mélancolique has also been active in the recording studio, and the duo now has seven CDs available. 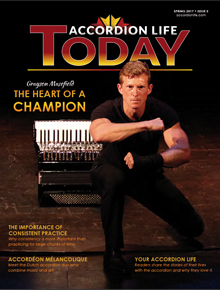 There is good news for accordionists wishing to play their music: each CD is accompanied by a book of sheet music published by Reba Productions in the Netherlands. The CDs and sheet music include duets and solos of pieces arranged or composed by Jean-Pierre. The arrangements are tunes from a number of music traditions around the globe, and even the original compositions of Jean-Pierre are inspired by a variety of musical genres. The CD and songbook Les Invités is quite typical, at least of the first five CDs, so it will be described in a little detail. First, the collection includes several arrangements of world music: two klezmer pieces, a traditional Swedish folksong, Saint-Saëns’ The Swan, and three of Nino Rota’s themes from The Godfather movie. The other eight pieces are original compositions of Jean-Pierre: a Brazilian free clave Bougainville, a swing Ma Chérie, two Caribbean claves Padikiti Dikitika and The Dancing Tortoise, the harp waltz Por el Camino Real from Venezuela, and two French café pieces Requiem pour une Rose and L’arriveé des Invités. The book also contains Jean-Pierre’s Indonesian-inspired Tanah Tumpah Darah, which has a beautiful cantabile melody that floats above a driving kronchong rhythm. The subtitle, “her native country,” is a reference to Cherie’s birthplace, Jakarta. All of the songbooks are “Pour 1 ou 2 Accordéons,” and indeed they work nicely either for one or two players. Another possibility is to have a violin, flute, clarinet or other melody instrument play the Accordion 1 line. The duo’s sixth and latest CD/Songbook, Aquarelles, became available last year. It is a little different from the others in being thematic. As its subtitle, Waterworks, suggests, the 15 original compositions of Jean-Pierre are all related to water in some way. Jean-Pierre describes Aquarelles this way; “It started all with a composition that we named Mermaid. Playing that song we had a strong association with water. And then the Yann Tiersen-ish pieces like Quicksand and Water Cave bubbled up. Minimal music pieces like Aquarelle d’Amour and Ebb and Flow arose while recording the CD. We have now lived eight years within walking distance of Wadden Sea in the north of the Netherlands, and before this we lived 25 years near a small lake in the middle of the country. My father was a sailor in the merchant navy and later worked at a shipyard. Finally, Cherie made a weeklong voyage over sea, from Indonesia to the Netherlands, a single day after her birth. So clearly, our bond with water is deeply engrained within us.” All of the six songbooks are graced with Cherie’s paintings, making them possibly the most beautiful sheet music books ever published. She is mainly focused on impressionistic oil paintings on canvas, but also creates aquarelles and pastels. She finds similarities between her art and her music: sound and silence become color and no color, harmony in music is reflected by harmony in colors. The painting shown here is included as a two-page spread at the centerfold of Aquarelles. The piece Swan & Swan, including Cherie’s painting can be found on the following pages, reprinted here with the kind permission of Reba Publication. About the Authors Emma Carscallen is a senior at Moscow High School, Moscow Idaho, and co-authored this article as part of her Extended Learning Internship project on accordion. Duane DeTemple, a retired professor of mathematics at Washington State University, served as Emma’s Extended Learning Internship mentor; he played accordion as a boy and recently started to play again after an accordion-free gap of nearly 50 years. Enjoy the Music Swan & Swan on the next pages! En als een artistiek en muzikaal hoogtepunt kwamen de twee vertolkers van Accordéon Mélancolique uit Nederland: Cherie de Boer en Jean-Pierre Guiran. Een bekend accordeonduo, zeer populair in de Lage Landen, dat het publiek verrukt met prachtige liedjes van populaire muziek maar ook van eigen auteurschap, tussen het Franse lied en de blues in. De beheersing die ze toonden van de twee accordeons was echt buitengewoon, waardoor de longen van hun twee krachtige instrumenten met hun ademhalingen perfect op elkaar afgestemd waren. 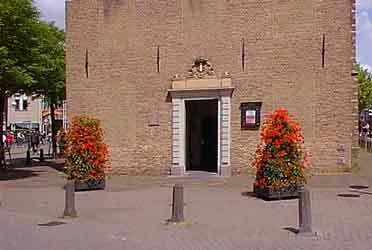 Theaterboerderij Boeket in het Limburgse Nederweert is een klein maar sfeervol non-profit theater waar jong talent en gearriveerde artiesten de kans krijgen om zich te profileren. 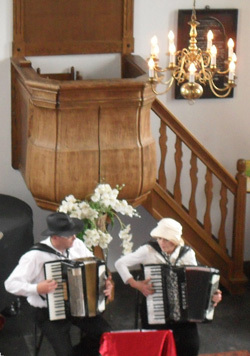 Het accordeon duo ‘Accordéon Mélancolique’ treft hier op een druilerige lentemiddag een zeer aandachtig publiek dat ademloos luistert naar fijnzinnige, met veel gevoel gespeelde, rustgevende muziek. Al bij het eerste muziekstuk wordt je onmiddellijk meegevoerd in de sfeer en vergeet je alles om je heen. Het duo waarvan de een veelal de melodielijnen en de ander de ritmische begeleiding speelt, blijft gedurende hun gehele optreden boeien met verrassende composities waarvan de meeste door hun zelf zijn gecomponeerd. Verwacht bij dit ‘Accordéon Mélancolique’ geen technische acrobatiek of grootse gebaren op het instrument. Ogenschijnlijk is het eenvoudige muziek maar schijn bedriegt want de kwaliteit zit niet in technische complexiteit maar in een fijnzinnige en gevoelige muzikaliteit, mooie toonvorming, perfect samenspel en een rijkdom aan sferen. Stijlkenmerken van hun muziek zijn heldere melodielijnen met soms verrassende wendingen en bijzondere klankkleuren. Het is erg beeldende muziek die niet zou misstaan als filmmuziek. Hier geldt: minder is vaak méér. De sfeer is, zoals de naam van het duo al aangeeft, de ene keer melancholiek maar een ander keer weer vrolijk en uitbundig en altijd zeer aangenaam om naar te luisteren. 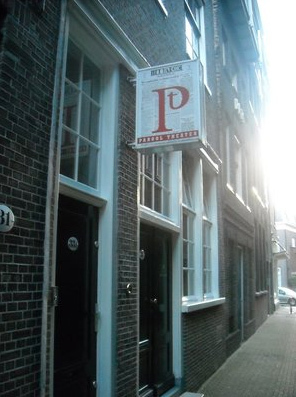 In dit kleine theater zit je dicht bij de artiesten wat het optreden intiem en bijna persoonlijk maakt. "comme un enfant montre une belle coquille"
Interview in het Franse blad Accordéon & Accordéonistes. Jean-Pierre Guiran, c'est un nom français, ça, non ? Où es-tu né ? Oui, bien sûr, c'est un nom français. Mes ancêtres, selon la ligne masculine, sont venus de Saint-Pierre-église, en Normandie. Notre famille en France s'appelle Guerrand. Moi, je suis né aux Pays-Bas, à Flessingue (Vlissingen en néerlandais), un port dans le sud. J’ai grandi avec un tic français. On interprétait des chansons françaises populaires. On mangeait et on buvait des produjts français. On allait en vacances en France, on avait des amis français. Comment as-tu rencontré l'accordéon ? Quelle est ta formation et quels sont les accordéonistes que tu affectionnes ? Chez nous, nous avions un harmonium dont j'ai appris à jouer moi- même . Pendant mes études de physique à Utrecht, j'ai rencontré un étudiant qui avait un accordéon. Et j'ai découvert que je pouvais jouer de cet instrument presque tout de suite. Mes premières compositions, comme Helena, sont nées pendant cette période. Depuis plusieurs années, cette mélodie aussi bien que le morceau Parade des poules sont utilisés par le groupe hip hop français Accrorap dans leur spectacle réussi "Petites histoires.com". La musique m'intéressait de plus en plus et la physique de moins en moins. J’ai suivi une formation au conservatoire d'Amsterdam, avant de continuer en autodidacte. Internet n'existait pas mais il y avait un excellent rayon musique dans une bibliothèque d'Utrecht. J’y ai emprunté tout ce que suscitait mon intérêt: blues, folklore, classique, jazz, musique populaire française ... Je n'ai pas écouté beaucoup d'accordéonistes ; le seul qui sortait du lot, pour moi c'était Gus Viseur, un musicien plein d'idées originales. Avant Accordéon Mélancolique, tu as évolué au sein du groupe swing musette Polytour et du Bubblin' Toorop Trio, enregistrant avec eux plusieurs excellents disques. Peux-tu nous parler de cette aventure ? Deux personnes furent importantes dans ma décision de dédier ma vie à la musique: Lembosh Wilca et Koen de Cauter. En voyant Koen De Cauter en spectacle avec Waso dans un petit club à Utrecht, j'ai pensé: “Voilà la musique que je veux faire!” Lembosh Wilca, violoniste tzigane, est le premier musicien qui m'a montré qu'il était possible de gagner de l'argent en jouant. Pendant deux ans, j'ai fait beaucoup de musique avec lui, jusqu'à sa mort. Avant de mourir d'un cancer à l'âge de 60 ans, il m'a présenté à Wilco Jordi, violoniste de jazz et guitariste-chanteur du Bubblin' Toorop Trio. J’ai travaillé avec eux durant des années, apprenant pendant cette période les improvisations de jazz. J'ai beaucoup joué, également dans un grand groupe latin . Et j'ai commencé à faire de la musique avec Cherie de Boer, ma partenaire depuis longtemps au sein d'Accordéon Mélancolique. Après avoir fait mes classes musicalement avec le Bubblin' Toorop Trio, j'ai décidé de former mon propre groupe, Polytour. Mon idée était de laisser swinguer des chansons françaises sur des rythmes d'un quartette à la Hot Club de France, avec accordéon. Dès le départ, nous avons eu pas mal de succès avec Polytour. Comment le duo Accordéon Mélancolique s'est-il formé et pourquoi ce nom ? Après la mort de Lembosh Wilca, je continuais à recevoir des appels téléphoniques pour des schnabbels ("à côtés") pour deux personnes. Cherie de Boer n'aimait pas le travail qu'elle faisait à l'époque. Aussi, elle a fait des efforts afin d'améliorer son niveau à l'accordéon, instrument dont elle avait joué étant jeune fille. Nous avons alors joué ensemble dans des fêtes et mariages. Après douze années, en 1998, nous avions atteint le niveau suffisant pour notre premier concert ensemble et enregistrer notre premier disque, "L'imparfait du cœur". Ce succès dure jusqu'à aujourd'hui. Le nom Accordéon Mélancolique a été inventé par l'imprimerie qui a imprimé nos premières cartes de visite. Le duo a sorti six CDs en autoproduction. N'avez-vous pas essayé de démarcher des labels? Vivez-vous de la musique ? Oui, j'ai essayé de démarcher des labels mais je suis heureux de n'avoir jamais réussi. Car depuis iTunes et la possibilité de télécharger légalement des mp3, nous avons gagné pas mal d'argent. 70 % pour les artistes! C'est mieux que le 2 ou 3 % qu'on reçoit d'un label. Nous vivons de là musique depuis 1985. À part les cachets des concerts, on vend des CDs, mp3 et des partitions dans le monde entier. On reçoit aussi de plus en plus de droits pour l'utilisation de notre musique dans des films, des documentaires, de la danse, du théâtre ainsi que dans la publicité à la télévision. Vous accordez beaucoup d'attention à la mélodie, tant dans vos diverses reprises que dans vos compositions. Comment travaillez-vous et comment définissez-vous votre musique ? Je pense mélodie. Je sens et vois presque la force entre la mélodie et l'harmonie. L'harmonie qui chasse la mélodie et vice-versa. Je n'entends pas de grandes choses orchestrales mais l'élégance et la pureté du mouvement de la mélodie, c'est ça. En tant que compositeur, je travaille comme de nombreux autres ouvriers créatifs, par ondes d'activité. Parfois, je travaille durant des heures, des jours, en oubliant le temps. Parfois, je ne fais rien pendant des semaines, traversé par des sentiments sombres et mélancoliques. De temps à autre, je sens une urgence d'exprimer mon humeur, mes émotions sur un instrument. Et si je suis dans un environnement où il n'y a pas un piano, un accordéon, une guitare ou une flûte, je me sens désespéré. Dans quels genres d'endroits vous produisez-vous en Hollande ? Au cours des dernières années, la plupart de nos activités sur scène sont des concerts, parfois dans le cadre d'un festival, surtout en Hollande mais aussi à l'étranger. Par exemple, en avril dernier, nous avons joué les hymnes néerlandais et égyptien (et beaucoup d'autres musiques) à l'ambassade néerlandaise du Caire pour deux cents diplomates internationaux. N’arrivez-vous pas à vous lasser de cette formule à deux accordéons ? L’idée de deux accordéons n’est pas sacrée et je ne sais pas ce que ce sera dans l’avenir. En dehors de ce duo, je fais toujours de la musique avec d'autres musiciens, chanteurs, etc. En général, je me sens très privilégié de pouvoir faire ce que je fais: chercher la beauté et la montrer au monde comme un enfant montre une belle coquille. Propos recueillis par Francis Couvreux, Accordéon & Accordéonistes. "Wat een muzikale belevenis, wat een fantastische uitvoering, wat een professionaliteit - Klank"
Terwijl af en toe gerinkel van bierglazen en flarden van luidruchtige gesprekken naar binnen waaiden, speelden Jean-Pierre Guiran en Cherie de Boer alsof ze voor een uitverkochte schouwburgzaal optraden. Er was een geweldige interactie met het publiek. Muziekstukken in allerlei stijlen wisselden elkaar af. Musette, latin, chansons of tango's, met elkaar verbonden door een mooi bijpassend citaat. Ik kende natuurlijk de cd's van Accordéon Mélancolique en ik had ze ook al wei eens eerder live bezig gehoord, maar ik moet zeggen dat ik na afloop van een concert zelden met zo'n goed gevoel naar huis ben gegaan. Wat een muzikale belevenis, wat een fantastische uitvoering, wat een professionaliteit om je voor een handvol luisteraars net zo volledig te geven ais voor een volle zaal. Mijn waardering en bewondering voor dit duo is sindsdien nog weer groter geworden. "Men waande zich letterlijk in een scheepje, dat stil lag tussen de waterplanten"
"Zeer geslaagd optreden Accordéon Melancólique"
In de Ioannis Theaterkerk te Wier, werd afgelopen zondagmiddag 1 september, de sfeervolle muziek van duo Accordéon MeIancólique t.w. Cherie de Boer en partner Jean-Pierre Guiran uit St.-Jabik ademloos beluisterd. De vele bezoekers, zo rond de 75, genoten met volle aandacht. Men waande zich letterlijk in een scheepje, dat stil lag tussen de waterplanten. Van alle kanten omsloten door 'waterwerken', schilderijen met waterlelies geschilderd door Cherie de Boer, was de sfeer onovertroffen. De ambiance met de hiérop gecomponeerde muziek door Jean-Pierre Guiran was volkomen op elkaar afgestemd. Heel verrassend was ook af en toe een vocaal intermezzo van het echtpaar, enige Franse chansons. Een gedicht, haiku of kleine anekdote verbrak af en toe het ingespannen luisteren. Er kon even gelachen worden, waardoor het hele gebeuren weer meer licht en lucht kreeg. "Accordéon Mélancolique heeft een 'eigen plek' weten te vinden"
"De Muziekkamer Edam stroomde gistermiddag over"
De Muziekkamer Edam stroomde gistermiddag over. De geplande (achter)tuinzaal was veel te klein, maar initiatiefneemster Maisa van der Kolk wist de zaak te redden door de artiesten te verplaatsen en binnen stoelen bij te zetten. De Muziekkamer Edam, een gebouwtje aan de Kaasmarkt in Edam, is met de collectie Europese snaarinstrumenten aan de wanden bijna een klein museum. Maisa van der Kolk geeft op enkele weekmiddagen praktische uitleg over de instrumenten. Ze organiseert ook kamerconcerten op zondagmiddagen met verrassende gasten. Deze keer zijn dat Cherie de Boer en Jean-Pierre Guiran, als accordeonduo 'Accordéon Mélancolique'. Accordeonmuziek is vaak gekoppeld aan volksmuziek, virtuoze, musette, een enkele keer aan jazz. Accordéon Mélancolique heeft een 'eigen plek' weten te vinden. Lichtvoetig, transparant, met weinig noten, eenvoudig, maar pakkend. Een verbindend element zit in de gekozen bandnaam: melancholiek. Van het positieve, lichtvoetige soort. De helft van het repertoire is eigen werk, de andere helft bestaat uit gearrangeerde klassiekers als bijvoorbeeld 'Que reste-t-il de nos amours?' 'Douce France' en 'Creole love call'. Ook onbekendere traditionals in een melodieuze setting aIs 'Feliz Viaje', een verrassende 'Krontjong Penawar Duka' en 'Flambée Montalbanaise' spelen Cherie de Boer en Jean-Pierre Guiran ingetogen. Het duo leidt de nummers in met een klein, relativerend gedicht dat de muziek vaak een zetje geeft. Waar Cherie de Boer begeleiding speelt (in Creole love call zelfs gewoon op de accordeon kloppend), neemt Jean-Pierre Guiran af en toe een improvisatie voor z'n rekening. Niet te gewaagd, maar wel lekker in het akkoordenschema passend. In het samenspel vindt het duo een mooie afwisseling. Het publiek is muisstil. Opvallend dat de gemiddelde leeftijd van de ongeveer vijftig bezoekers boven 'de zestig ligt. "Maar dat was ook al zo toen ik dertig jaar begon met optreden", vertelt Guiran. Dat veel mensen de Franse tekst van 'Douce France' spontaan zachtjes meezingen, valt hem ook op. Ook dat zoveel mensen hebben genoten van de originele accordeonmuziek. "Ragfijne en subtiele klanken vulden de ruimte van de Stompe Toren - www.stompe-toren.nl"
"Met de slagregens op de ramen vulden ragfijne en subtiele klanken de prachtige ruimte van de Stompe Toren"
Een aantal jaren geleden ontdekten zij de voorname rol die stilte speelt in muziek. Deze ogenschijnlijke tegenstelling, muziek en stilte, leidde tot een hergeboorte van hun speelstijl. Door deze bewuste combinatie van stilte en geluid als bouwsteen van hun muziek, kregen zelfs de meest eenvoudige stukken een intense, boeiende spanning. En zo werd het een sprankelende middag vol ritmische melodieën. Maar is accordeonmuziek in deze tijd niet achterhaald? Absoluut niet! In een bijna volle Stompe Toren klonken vanaf 14.00 uur schitterende melodieën en spannende ritmes. Latin, blues, tango, chansons, wereldmuziek en klassiek passeerden de revue, gelardeerd met citaten en gedichten van eigen hand en van bekende en onbekende wereldsterren. Met de slagregens op de ramen vulden ragfijne en subtiele klanken de prachtige ruimte van de Stompe Toren. Je kon af en toe een speld horen vallen, even wegzwijmelend naar exotische oorden, of naar een terras met een goed glas wijn genietend van het leven. Jean-Pierre Guiran en Cherie de Boer maakten er een heerlijk feestje van. En ook de jeugd werd niet vergeten met een swingend meezingend nummer. Het publiek was enthousiast over zoveel schoonheid en het sprankelende, ingetogen en levenslustige vocale en instrumentale spel. Een staande ovatie viel hen ten deel. Ze komen zeker terug in de Stompe Toren! "Het fraaie Clandestin doet mij de rillingen over de rug lopen - Klank"
"Het fraaie Clandestin doet mij de rillingen over de rug lopen"
Op een zonovergoten maartse dag bevind ik mij in de Zuidervermanig, een sfeervol kerkje in Westzaan. Uit de flarden van gesprekken die ik opvang, kan ik opmaken dat er behoorlijk wat accordeonisten aanwezig zijn. Dat kan ook haast niet anders , want we zijn te gast bij Jean-Pierre Guiran en Cherie de Boer, oftewel het duo Accordéon Mélancolique. Cherie en Jean-Pierre begroeten hun publiek als goede vrienden, en openen met het vrolijke Bougainville van de nieuwste CD Les Invites. Even later volgt Merel van le Nid Aime. De composities van Jean-Pierre Guiran zijn toegankelijk, functioneel en sterk. Hun grootste kracht lig in de verbeelding en de vertelling. Om de zeggingskracht te versterken, dragen de Boer en Guiran er citaten en korte gedichten bij voor. In combinatie met de tekstregel: "een gekleurd schelpje tussen miljoenen, de zee maakt geen onderscheid", doet het fraaie Clandestin (Illegaal) mij de rillingen over de rug lopen. Het gevoel dat Jean-Pierre Guiran in zijn composities legt, komt ook tot uiting in zijn spel. Zijn intonatie en dynamiek zijn opvallend mooi. De rolverdeling tussen beide spelers is strikt. Ze volgen elkaar door een open, liefdevolle communicatie. Na het concert liggen de door Cherie fraai vormgegeven cd's en speelboeken uitgestald voor het publiek. De dromerige muziek, de chansons, de sfeer die dit duo weet neer te zetten, ze voeren je mee naar een wereld waarin accordeonmuziek, ontdaan van quasi-virtuoze opsmuk, pure emotie wordt. Een heerlijke middag! "Het optreden stond dan ook als een huis - Het Parool, NL"
"Het optreden stond dan ook als een huis"
Zwaarmoedig en droefgeestig. Het was de gemoedstoestand waarin het duo Accordéon Mélancolique in 2006 de nummers van zijn cd Le Nid Aimé (het beminde nest) schreef. Niet zo verwonderlijk. Jean-Pierre Guiran en Cherie de Boer haalden destijds de inspiratie voor de voor het grootste gedeelte zelfgeschreven stukken uit de ellende rond hun huis in Driebergen. Het tweetal had problemen met een projectontwikkelaar die ze weg wilde hebben. In de liedjes was dan ook het nodige verdriet te horen. Drie jaar later is alles anders. Guiran en De Boer hebben inmiddels hun geluk gevonden in Sint Jacobiparochie in Friesland en hebben naar eigen zeggen de ellendige periode volledig afgesloten. En dat is te horen op hun nieuwe cd Les Invités (de genodigden), waarvan ze - gisteren in het Parool Theater een groot aantal nummers lieten horen. De melancholie is niet helemaal verdwenen, maar de vrolijke noot heeft de overhand. Guiran en de Boer nemen je opnieuw mee op een muzikale wereldreis naar vooral zonnige bestemmingen. Van Franse chansons via Argentijnse tango’s naar rauwe Amerikaanse blues - Guiran en de Boer draaiden er in het Parool Theater hun hand er niet voor om en het optreden stond dan ook als een huis. Het was moeilijk stil te blijven zitten. Zelfs een door een bezoekster meegenomen hond deinde vrolijk mee op een nummer over een dansende schildpad. Het duo liet tijdens het optreden ook een paar keer horen nog steeds een gevoelige snaar te kunnen raken. Het bewees maar weer eens dat gevoelige ballades ook uitgevoerd kunnen worden op de accordeon. Het publiek, inclusief de hond, werd er stil van. Dat duurde echter niet lang, want Guiran en De Boer zorgden vooral voor een zonnig gevoel met hun aanstekelijke nummers. Ze vroegen zich daarom na afloop van hun optreden lachend af of ze misschien hun naam moeten veranderen in Joyeux (vrolijk) Accordéon. De melancholie heeft immers niet meer de overhand. Of er een naamsverandering komt, moeten ze helemaal zelf weten. Zolang ze maar mooie muziek blijven maken. "De twee weten de zaal te boeien, een puur spel in een hechte samenhang. - Hoog en Laag, NL "
"De twee weten de zaal te boeien, een puur spel in een hechte samenhang"
"Energie met een hoofdletter - Accordeon Actueel, NL"
Daar konden we genieten van de prachtige muziek van het duo Jean-Pierre Guiran en Cherie de Boer in een sfeervolle omgeving, de Dordtse Trinitaskapel, een voormalige kapel behorende bij het Blindengasthuis (13e eeuw). 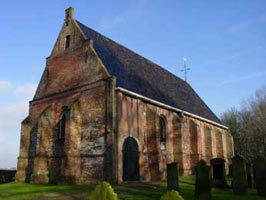 Ooit werd het gebruikt als turfschuur en kistenmakerwerkplaats en na 1629 in gebruik genomen als Lutherse Kerk. Nog steeds als bedehuis met een goeie akoestiek en die omgeving is juist zo belangrijk om de schoonheid van de muziek volledig tot zijn recht te laten komen. Pure akoestische muziek, op twee oude, doorleefde instrumenten en wat een meerwaarde aan het geheel geeft is de manier waarop het wordt gebracht. Men wil niet demonstreren hoe goed ze wel zijn en hoe vaardig op het accordeon, nee de hoofdzaak is te laten horen hoe mooi deze muziek klinkt en proberen dit op het publiek over te brengen. Hun muziek is, zoals ze zelf zeggen levenslustig, intens maar ook melancholisch en daar moeten we voor openstaan. Dat is de opdracht en dat is nu juist het speciale wat een dergelijk concert uit tilt boven een ander willekeurig accordeon optreden, waar spelers willen laten zien hoe goed ze wel zijn en waar de gezelligheid de hoofdmoot is. Het publiek bij hun spel te betrekken en ze laten meegenieten staat bij dit duo voorop en terecht ervaar je dan dat (deze)muziek emotie is, Emotie met een hoofdletter! Je kon dan ook een speld horen vallen. Hier kwam men dus echt om te luisteren. Veel eigen composities, waarin de een soleert en de ander begeleidt om dan plotseling de rollen weer om te draaien. Vooral de eigen composities vormen m.i. een verrijking voor het huidige accordeonrepertoire in dit genre. Twee maal drie kwartier hebben we genoten van hun spel, gevarieerde muziek uit alle windstreken met daartussen zelfs een compositie van onze plaatsgenoot Jan-Hubert Janssens, de stuwende kracht van Accordeonvereniging l` Avenir uit Dordrecht en die samen met Paula v/d Berg de organisatie op zich namen om het duo Accordéon Mélancolique op zondag 16 Maart j.l. naar Dordrecht te halen. Verwacht van mij geen lijst van de gespeelde melodieën, je vindt ze allemaal terug op hun nieuwe CD`s we kunnen er dus steeds opnieuw van genieten. Hoewel.... Accordeon Melancolique live mee te maken in een sfeervolle ambiance is op het gebied van muzikaal genieten toch net even iets meer. Jan van Nieuwkoop voor Accordeon Actueel Maart 2008. "Ruimte voor dialoog - Nieuws uit Katlijk, NL"
Ruimte voor dialoog Dinsdag 29 januari is er een inspraakavond in het Hof van Schoterland over de verlichtingsproef in Katlijk en omstreken. De zaal is afgeladen vol. Als na een inleiding de wethouder en de projectleider van de gemeente het woord voeren, wordt er vanuit de zaal voortdurend gereageerd. Het lijkt erop dat het verhaal van de sprekers niet aankomt in de zaal. Elke gelegenheid om de onvrede te uiten wordt aangegrepen. De gemeente heeft met de proef blijkbaar iets geforceerd wat heftige emoties en weerstand heeft opgeroepen. Na de sprekers is er gelegenheid voor de mensen in de zaal om te reageren. Een gespreksleider moet alle zeilen bijzetten om het geheel in goede banen te leiden. Met de nodige moeite maakt hij ruimte voor alle meningen en emoties. Het algemene gevoel onder alle reacties is: “er is ons iets opgedrongen” en “er wordt niet naar ons geluisterd”. Door de heftige emoties wordt hier en daar zelfs op de man gespeeld; dat mensen van de gemeente alleen maar op eigen belangen uit zijn. Door dit alles eindigt de avond onbevredigend. Het lijkt alsof de zaal zo vol zat met ieders meningen en emoties dat er geen ruimte was om elkaar te ontmoeten in een dialoog. Standpunten lijken zich alleen maar te verharden. Als contrast hiermee een mooie zondagmiddag in de Thomastsjerke. 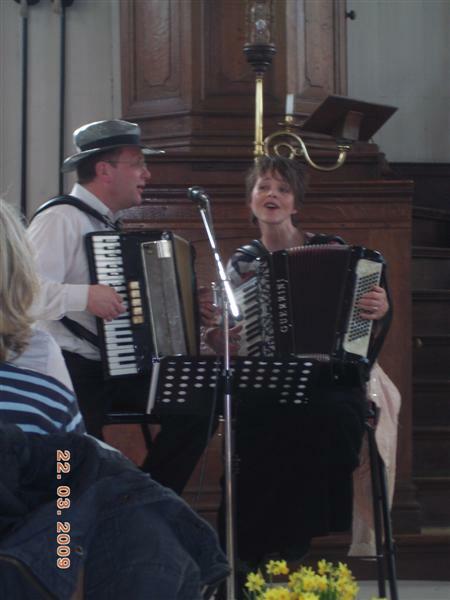 Op het programma een concert van Accordéon Mélancolique, een accordeonduo dat muziek uit alle windstreken vertolkt. 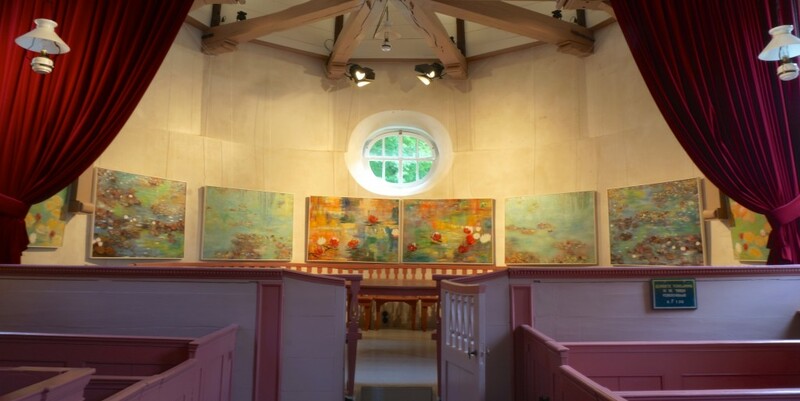 Bij binnenkomst blijkt de kerk al goed gevuld te zijn. Met wat schuiven of inschikken blijkt er voor elke nieuwkomer steeds nog een geschikt plekje te vinden. Een verwachtingsvolle stemming is voelbaar in de kerk. Het duo vloeit na hun opkomst als vanzelf in deze sfeer. Na een kort intro beginnen de accordeons hun samenspraak: nu eens speelt de één de melodie en begeleidt de ander, even later is het omgekeerd of spelen beide een melodie. Maar steeds is er ruimte, waarin beide naar voren kunnen komen of weer terug bewegen. Zelfs als toehoorder is die ruimte beschikbaar als een uitnodiging om mee te bewegen in de muziek. Het lijkt net alsof de accordeons niet alleen met elkaar een dialoog hebben, maar ook met de zaal. Mede hierdoor is het voor mij een prachtige middag en kom ik met een verrijkt gevoel de kerk weer uit. Hoewel beide situaties natuurlijk niet te vergelijken zijn, wil ik toch proberen mijn ervaring op de muziekmiddag te vertalen naar de lichtproef. Muziek verbindt ons met elkaar, maakt dat we ons open stellen, waardoor belangen even wegvallen. De vraag is of we ons ook kunnen verbinden en open stellen als het over de lichtproef gaat. Kunnen we echt luisteren naar elkaar? Kunnen we ruimte maken in onze standpunten en belangen, zodat de ander ook hoorbaar wordt en ieders geluid kan bijdragen aan de muziek. Ik hoop oprecht dat nu de onvrede een plek heeft gekregen tijdens de avond, de dialoog de komende tijd echt op gang gaat komen. De enquête is wat mij betreft een eerste stap. Wat ik daarnaast zie is een dialoog tussen bewoners en gemeente om per straat of situatie te evalueren, wat werkt en wat niet. Een dialoog met ruimte voor ieders mening en standpunten; met elkaar de juiste toon vinden zodat ieder kan bijdragen aan de muziek. En zo te komen tot een oplossing die zowel vernieuwend als voor ieder ook acceptabel is. Want alleen als ieder bereid is ruimte te maken voor de ander kan de dialoog een vernieuwing opleveren. Hopelijk wordt de lichtproef zo een verrijkende ervaring voor zowel de gemeente als de bewoners. Rob Poiesz naar aanleiding van het concert van Accordeon Melancolique in Katlijk maart 2008. "Het publiek werd er stil van - Het Parool, NL"
"Het publiek werd er stil van"
De komst van de zomer bespoedigen. Dat wilde het duo Accordéon Mélancolique dinsdag: Jean-Pierre Guiran en Cherie de Boer, met een zeer breed scala aan muziek op hun geliefde accordeon, waarbij ze nummers speelden van hun vier cd's. Het werd een swingende show, waarbij het publiek moeilijk stil kon blijven zitten. Het duo nam je mee op muzikale wereldreis naar vooral zonnige bestemmingen. Van Franse chansons via Argentijnse tango's naar rauwe Amerikaanse blues - niets was Guiran en De Boer te veel. Daarbij viel op dat de musici zichtbaar genoten van het optreden. Dat werkt aanstekelijk op het publiek. De oproep van Guiran de buurman of buurvrouw even vriendschappelijk in de arm te knijpen, werd direct opgevolgd. Het leidde tot hilarische taferelen tussen totale onbekenden van elkaar. 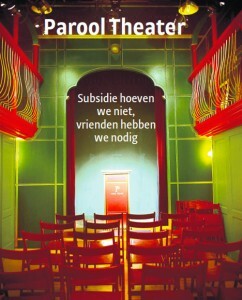 Accordéon Mélancolique slaagde er al met al in een zomers gevoel los te maken in het Parool Theater. Je had echt het gevoel met een glas wijn in de zon op een balkon, terras of in het park in Parijs, Madrid of Buenos Aires te zitten. Toch ontbrak enige melancholie niet. Ze lieten horen dat chansons van Brel en Trenet prachtig uitgevoerd kunnen worden op de accordeon. Het publiek werd er stil van. Maar dat duurde dat niet lang, want Guiran en De Boer zorgden steeds snel weer voor een vrolijke noot. Ze speelden uiteindelijk veel langer dan gepland. Het publiek bleef nummers aanvragen. En zelfs na afloop van het optreden was de muziek van het duo nog te horen. Op veelvuldig verzoek werd de laatste cd opgezet. Guiran en De Boer gingen er bijna van blozen. Bij een Kaapverdisch nummer zei Guiran dat als ze het goed speelden, het vandaag mooi weer zou worden. Laat Accordéon Mélancolique maar veel spelen. Dan wordt het een lange, hete zomer. "Dat je, als je je "muziek" voelt, ook "muziek" kunt zijn. - Avro. NL"
"Dat je, als je je "muziek" voelt, ook "muziek" kunt zijn"
Als Jean-Pierre Guiran en Cherie de Boer zondag 18 februari wakker worden, kijken ze uit het raam, wandelen even naar buiten, proeven de atmosfeer, voelen de sfeer in zichzelf, bepalen dan de kleding die volgens hun gevoel bij deze dag hoort en wat ze in Gouda, in de Agnietenkapel, zullen gaan spelen. Zo werkt dat bij dit accordeonduo. Langzamerhand is Accordéon Mélancolique een begrip in Nederland. Het betekent dat je, ook zonder degelijke theoretische opleiding, heel integer prachtige muziek kunt maken. Dat je, als je je "muziek" voelt, ook "muziek" kunt zijn. Cherie de Boer Het is niet zo vanzelfsprekend dat Cherie verliefd werd op de accordeon; ze is in Indonesië geboren en we weten allemaal dat een Indo bijna onlosmakelijk met de gitaar verbonden is. Ze werd dan ook vreselijk uitgelachen door haar familie en, gegeneerd, verstopte ze het lichtblauwe instrument onder haar bed. Maar echte liefde laat zich niet verstoppen. Later, toen ze haar eigen weg ging, kwam die eerste liefde weer boven en werd haar spel alom zeer gewaardeerd. Jean-Pierre Guiran Jean-Pierre komt uit een muziekminnend gezin. Bob Dylans en Dimitri van Torens op blokfluit en gitaar waren er regelmatig te horen. Vader Guiran speelde vaak op het harmonium, later op een electronisch orgeltje. Jean-Pierre vond die toetsen geweldig, leerde een beetje spelen met het toen zo populaire Klavarskribo-systeem en het is aardig te melden dat een van zijn eigen arrangementen onlangs in Klavar gepubliceerd is. Later Cherie ging pedagogiek studeren en Jean-Pierre natuurkunde. Hun wegen kruisten elkaar bij Toneelgroep Stut in Utrecht, waar Jean-Pierre accordeon speelde. Cherie herkende zichzelf in zijn "touch", beiden herkenden elkaars liefde voor de accordeon en voor elkaar en ontwikkelden zich steeds verder: ze luisterden naar muziek, speelden het na, probeerden akkoorden, combinaties, en zijn nu, je kunt wel zeggen, beroemd, worden veel gevraagd en hebben behoorlijk wat cd's op hun naam staan. Over elkaar Wat Cherie vindt van het spel van Jean-Pierre: "de beheersing van het instrument, de zorg voor het klinken van iedere noot afzonderlijk, de bijzondere timing, subtiliteit en toonkeuze, toongebruik, de kunst van het weglaten, maar aan de andere kant z'n erg onorthodoxe begeleidingen.." En Jean Pierre van Cherie: "Achter de bescheiden opstelling van Cherie gaat een sterk gevoel voor schoonheid schuil. Gracieus en oorspronkelijk speelt ze een melodie, nooit om aan een bepaalde stijl te voeldoen, nooit omdat het zo moet. Maar altijd omdat ze het zo mooi vindt. Ze speelt met gemak een melodie voor de helft zacht, om dan opeens op het goede moment uit te pakken, nooit zomaar of zonder aanwijsbare reden. Ze heeft ook een wonderbaarlijk gevoel voor een strak ritme. Haar begeleiding blijft altijd ademen, loopt niet dood". Agnietenkapel in Gouda De Agnietenkapel In de vijftiende eeuw kende Gouda vier vrouwenconventen, waaronder de Agnieten, de zusters van het St. Agnesconvent. Natuurlijk hoorde er een kapel bij het klooster, maar hoe de Gouwenaren ook hebben geprobeerd de middeleeuwse situatie terug te brengen, helemaal gelukt is dat niet. Daarvoor heeft de Agnietenkapel in de loop van ruim vijf eeuwen teveel verbouwingen en restauraties moeten ondergaan. Wat er precies allemaal met de kapel gebeurd is, is niet helemaal duidelijk geworden. Onder de huidige kapel zijn funderingen gevonden die mogelijk wijzen op ovens van een ververij die daar gevestigd zou zijn. Maar voor hetzelfde geld betreft het hier de oven van het klooster van toen. Er staat nergens duidelijk waar de kapel in die tijd voor diende. Wel is terug te vinden wat er allemaal verbouwd werd. Er is zelfs ooit een tribune in geweest. In de 17de eeuw is de kapel een bank van Lening geworden, die pas in 1924 gesloten werd. Het arme kapelletje werd kantoor, maar er werd niet van haar gehouden. Het gemeentebestuur van Gouda wilde op die plek een openluchtzwembad bouwen. Dat is dankzij dankzij financiÃ«le steun van de heer G. Bouwmeester voorkomen en werd de kapel wat ze nu is. Toen werd ook de vermoedelijke oven gevonden en trots zichtbaar gemaakt in het plaveisel voor de kapel. Zo is een roemloos einde voor de Agnietenkapel voorkomen. De ruimte wordt nu dan wel niet meer voor gebed, maar wel voor concerten, lezingen, exposities en recepties gebruikt. De zusters van St. Agnes kijken vanaf hun wolkje naar hun kapelletje en knikken goedkeurend. "zeer swingende show - Het Parool, NL"
Zwaarmoedig of droefgeestig, dat is volgens de Van Dale melancholiek. 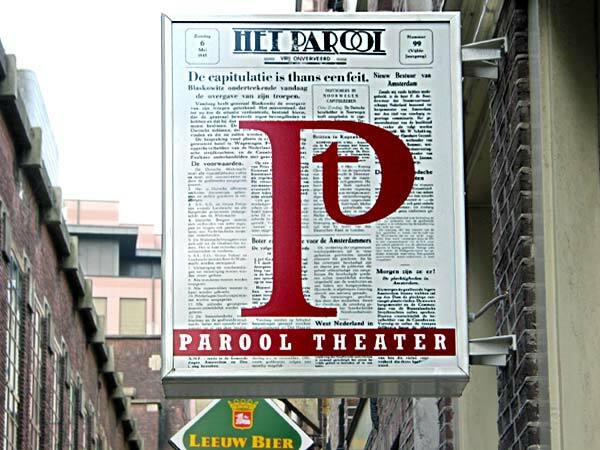 Het optreden van het duo Accordéon Mélancolique in het Parool Theater voldeed echter niet aan die beschrijving. 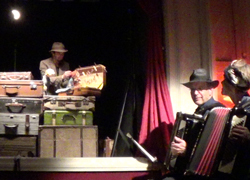 Jean-Pierre Guiran en Cherie de Boer gaven op hun accordeons juist een zeer swingende show weg. Het duo speelde ruim een uur lang nummers van zijn nieuwste cd, le Nid Aimé (het beminde nest). Ze haalden de inspiratie voor de voor het grootste gedeelte zelfgeschreven stukken uit de ellende rond hun huis in Driebergen. Guiran en De Boer hebben problemen met een projectontwikkelaar die ze weg wil hebben. Wie echter alleen droevige liederen verwachtte, kwam bedrogen uit. Het publiek kreeg een zeer breed scala aan muziek te horen. Van Frans chanson via Venezolaanse wals naar opzwepende merengue. Guiran en De Boer draaiden er hun hand niet voor om. Het was moeilijk stil te blijven zitten en je werd gewoon vrolijk van het optreden. De muzikanten lieten zien zelf ook te genieten van het optreden. Dat kwam vooral tot uiting toen ze een naar hun in de zaal aanwezige oom Carel vernoemd lied vertolkten. De duimen omhoog van oom brachten een nog grotere lach op de gezichten van het duo. Toch was er wel ruimte voor enige melancholie. Bij het titelnummer was het moeilijk de ogen droog te houden. Je voelde echt het verdriet om het zo beminde nest. 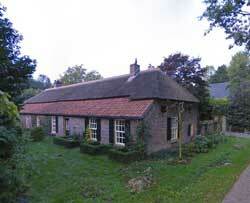 Het leek wel of Guiran en De Boer alle ellende rond hun woning van zich afspeelden. De woorden van een bezoeker spraken boekdelen. ''Gelukkig is er de accordeon.'' Met Guiran en De Boer komt het dus vast wel goed.